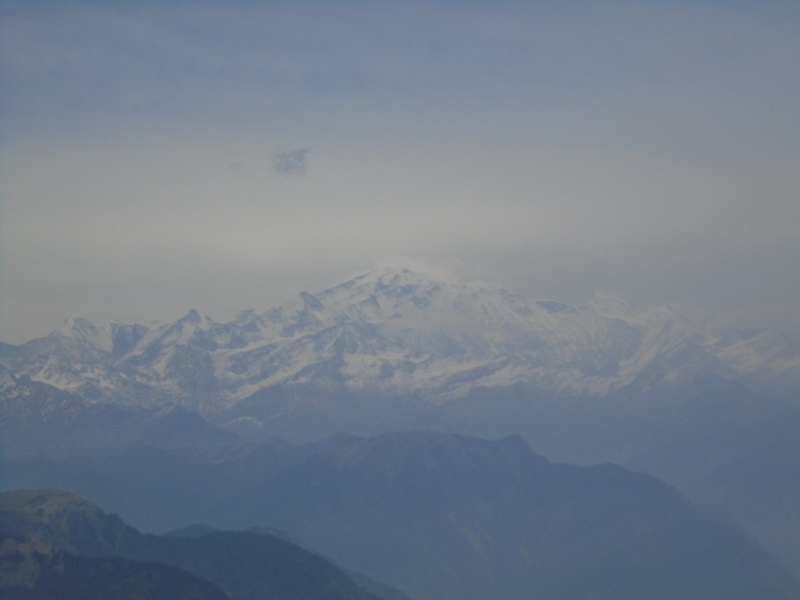 Chandrashila Chopta: A Learning Experience | It is Siddharth's world! It all started a few weeks ago when a good friend of my family told me that I should go for a trip with the Pune based tour company, ‘Foliage’ this summer after my 10th standard board exams. Well, I had heard of the company before from friends but had never really gone for a trip with them on my own. After some mild reluctance in the beginning, I agreed to go on a trek to Chandrashila Chopta with Foliage from the 19th to the 25th of April 2017. Well, the trek started out pretty awkwardly for me at the Pune Airport. It looked to me like I was the only person travelling alone amongst the 38 people coming on the trek. After reporting at the airport at 6 pm, two groups were formed, one flying to Delhi by an Indigo flight, and the other by a GoAir flight, of which I was to take the latter. Time passed by, and before I knew it, I was waiting for my flight, eating biscuits and awkwardly trying to make new friends around 8:30 pm. We took off around 9:30 and landed in the capital of India by 12 in the night. All of us collected our luggage and waited outside Delhi airport for about an hour. At 1:20 in the morning, we climbed into an overnight bus that would take us to Haridwar. After a bumpy bus-nap, we reached Haridwar by 6:40 am and switched to 2 smaller buses to navigate the steep and narrow bends leading up the mountains. All of us had breakfast at the Rishikesh campsite at 9 am. Here, at Rishikesh, we played a quick introduction game and left for the Jayalgarh campsite where we had our lunch at 1 pm. After encountering a mini landslide that blocked the road, extreme heat, irritating flies, stomach lurching turns, beautiful landscapes, disappointing naps and new friends, us ‘ Foliagers’ finally reached the Chopta campsite in the Rudraprayag district of Garhwal, Uttarakhand by 6 pm. This campsite, surrounded by the Himalayas was stunningly beautiful with no phone network or electricity. Here, we had some snacks after which we were allowed to check out our simple 4-person tents. Having come alone, finding a tent-mate was awkward, but I managed to find some newly found friends to live with. In the night, we had our dinner where we were briefed about the campsite and the next day’s trek. After this, we slept for the night in our cozy sleeping bags..
Today, we were trekking to the Lake of the Legends, Deorital at 7000 feet. The ‘Foliagers’ awoke by 6 am, and after breakfast, we left for the base of the climb. 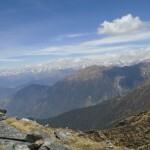 This was a training trek to prepare for the Chandrashila trek coming up the next day. We had to find our own way by asking the locals there. We reached the heavenly lake in about 2 hours after taking regular breaks with our teams, which were made by the instructors. Deorital was just angelic. The view of Chaukhamba peak from there was exquisite and my mind felt at peace at 7000 feet. Here, at Deorital, we spent 2 ½ hours and had lunch, took photos, chatted and played a game. Around 12 noon, we stared descending from the lake. Luckily/Unluckily for us, we were caught in a painful but never-before seen beautiful hailstorm. Occasional mules walking up and down and blocking the way were very entertaining to dodge and deal with. After returning back to our campsite, we played a fun game of volleyball succeeding which I realized how little I knew about the sport. Subsequently, all of us enjoyed some tea and then collected firewood for a campfire that was to be held the next day. A bright orange sunset and a game of dodge ball greeted us before dinner at the KPRD (khana-peena-rona-dhona), which was the common eating and meeting place. We were also briefed about the next day’s trek to Chandrashila. Personally, this common tent was where I got to speak to new friends. After washing up, we slept for the night in our cozy sleeping bags. 22nd April was a big day for us. We were about to scale Chandrashila, which is located at a height of 13000 feet. All of us left at 6:20 am and drove to the base of Chandrashila. All excited and pumped up, we all started the trek to Tungnath, which is the highest Shiva temple in the world. This temple is en route Chandrashila at 9000 feet. On the way there, we saw several Monals(state bird of Uttarakhand) and many Rhododendron trees. 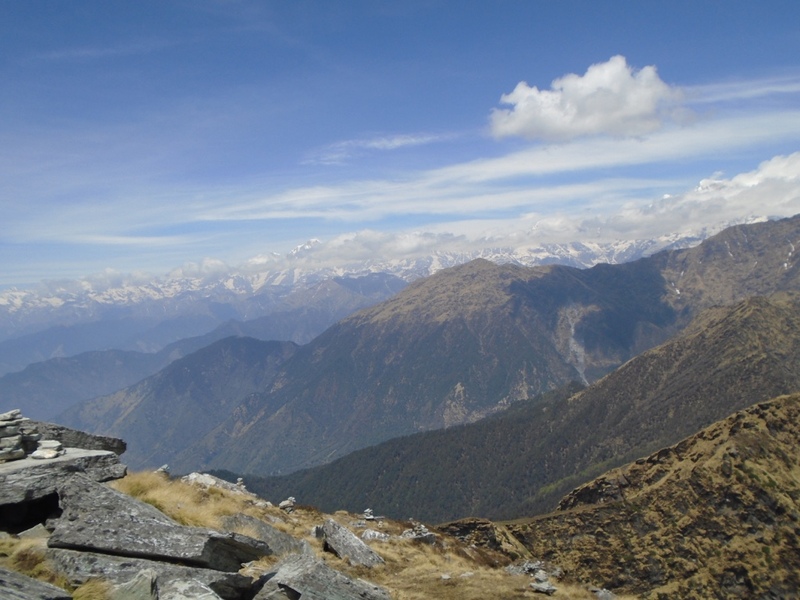 By noon, we reached Tungnath, and after lunch we started for Chandrashila. 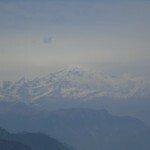 Soon, we reached Chandrashila and witnessed a 360-degree view of the snow-covered Himalayas. From here, we could see Nanda Devi at 25,600 feet, which is the 3rd tallest mountain in India. After spending an hour at Chandrashila, we started descending pretty quickly and came back down by 4 pm. After returning to the Chopta campsite, we all drank tea and had Maggie. A fun evening with multiple games of volleyball followed. As it became darker, we had soup and dinner. We were all excited for the campfire that ensued where multiple friends displayed their singing and dancing talents. I was sad because it was our last night at the Chopta campsite. Moreover, a friend of mine hadn’t been able to climb to Chandrashila because of a bad stomach. After the instructors briefed us about the next day’s program, we slept for the night in our cozy sleeping bags. We got our wakeup call later today, around 7. After a sluggish and relaxed breakfast and washing up session, we left Chopta and reached Jayalgarh in 3-4 hours. The campsite at Jayalgarh was fancier then Chopta with electricity and private toilets. Here, we had lunch and then left for White Water Rafting on the river Alaknanda. On the banks of the river, we were given instructions regarding rafting and then were made into 5 teams. Along the river, we rafted for 8 kms as a team. As and when told by the instructors, we even got to jump into the freezing cold water of the river. We reached a sandy mini-beach in an hour where we engaged in kayaking and ducky boating (basically, a ducky boat is a two person kayak where the passenger is asked to jump off the boat in the middle of the river and swim back). After these water sports, we came back to our tents in Jayalgarh around 6:30 pm. Tired and wet; we had our bath followed by tea and pakodas. While enjoying the beautiful scenery around Jayalgarh, I sat and chatted with friends till dinner. After dinner, all of us danced to some music and heard a vividly entertaining leopard story from one of our most experienced instrutors. I went to sleep at 11. Although there was no wakeup call today, my naturally acclimated body awoke at 6:15, 2 hours before breakfast. After, enjoying the beautiful scenery alone for half an hour, I found some friends and we played throwball for a while to pass time. Today, we were going to encounter the much-awaited Bridge Slithering, a hair-raising water activity. In this sport, one is tethered to a 55 feet tall bridge and is gradually let down before being dropped into the river from 10 feet. One by one, all of us completed this fun activity and returned to our tents. After lunch, we had a certificate distribution and camp farewell session. We bid a farewell to Jayalgarh after this and started our return journey to Haridwar by 2. After a 3-hour long journey, we stopped at the Rishikesh campsite for snacks. Soon, we reached Haridwar and switched back to our AC overnight bus to travel back to Delhi. After another bumpy 4-hour nap, we reached Delhi airport at 3 in the morning. Here, all of us waited outside the airport for 2 hours along with some interesting wildlife, i.e., crazy dogs and bloodthirsty mosquitoes. While walking around the outside the airport, I noticed a decent pizza place and immediately got a pizza from there. As luck would have it, 15 minutes after I bought the pizza, we were given packed breakfast by Foliage which I stored in my bag. By 6, we all walked into the airport and started the check in. At 8: 10, we boarded the flight and soon, departed from Delhi. We reached Pune at 11:30 pm and then, harboring mixed emotions, bid adieu to our new friends and returned to our familiar homes carrying a bag full of memories. Overall, all the experienced instructors on the treks inspired me. These beautiful campsites pulled us city kids out of the digital dream and taught us the importance of looking outside and taking in the breathtaking scenery. I would like to thank Foliage and its entertaining and experienced volunteers for lifting the mood and taking care of all of us. After attending this trek alone, I can safely say I made better friends than I would have if I had gone with my friends. As one of the Foliage volunteers said,” We went in different groups, but we are coming back as one family”, I went as a loner, but came back with a family.